I have updated the Maori MP's page with my thoughts on the best and worst performing Maori MP's of the month. As you would expect Hone comes out on top while his Maori Party colleagues occupy the bottom end of the list. You can view the page here or click on the Maori MP's page at the top. The absence of Te Ururoa Flavell and Pem Bird at today’s disciplinary hui was certainly a strategic move on their part. Predictably the Te Tai Tokerau electorate committee endorsed Hones stand and issued a number of disparaging statements regarding the Maori Party’s conduct. 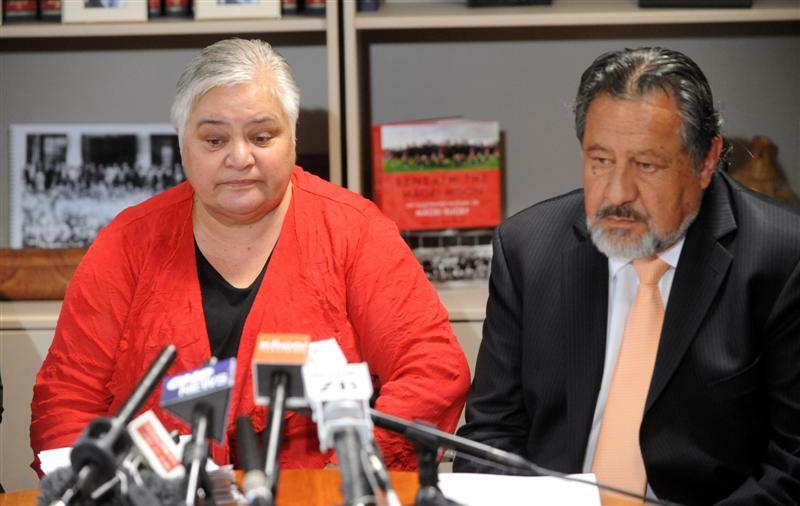 Given Pem and Te Uruoa’s absence the issue is now in the hands of a far more favourable forum – the national council. This certainly suits their aims. Resolution, or indeed the resolution the party hierarchy are seeking, will not come about through those members on the ground rather those at the top. I await Hone’s next move. Scott at Imperator Fish has an interesting post covering NZ lawyers who blog and it got me thinking about Maori who blog. I do not know of many besides perhaps marty mars, Tim Selwyn and Carwyn Jones. As far as I know there are no ‘prominent’ Maori bloggers on either the left or right. This is an unfortunate situation and one of the reasons I blog. If you do know of any, prominent and not so prominent, please let me know so I can compile a sidebar list. Hone has the Maori Party on the ropes and they know it. Public opinion, both Maori and non-Maori, is building in Hone’s favour. You know your position is righteous when, amongst the usual sympathetic commentators, the likes of Garth George and Fran O’Sullivan come out in support of you. When attacked Hone responds aggressively. In the past he has responded in a manner that arguably worsens the situation, however this time around he appears to be making all the right noises. The leadership is beginning to look increasingly weak and out of touch as a result of the sustained pressure Hone is applying. With opinion set firmly against the leadership the party elite need to realise that their end game (Hones expulsion) will be self destructive. Hone will without doubt take the integrity, mana and base of the party with him whilst those Maori at the flaxroots will return to Labour and/or the Greens. Some Maori (John Tamihere in particular) have shamelessly claimed this as a victory for Maori. It is not. Victory will only come in the form of dedicated, and by definition legitimate, Maori seats. The current arrangements are anathema to democracy and an insult to Maori voters. Why can we not elect our own representatives? I suppose self interest plays a large part in John Tamihere’s position. As a member of the Maori advisory board, and no doubt now member of many council committees, he has a tangible interest in the suppression of democracy and the continuation of the current autocratic situation. I am no fan of Shane Jones but he has not put a foot wrong in his response to the MP schism and unelected Maori sitting on council committees. As Pita’s name is tarnished further by the day Shane’s chances of snatching Tamaki Makaurau increase. Corporate cheerleader and profiteer Mark Solomon has, inevitably, come out in support of the government’s plans to partially privatise some state assets. Typically, Mark has only profit in mind as opposed to the well being of all his people and iwi katoa. It is interesting to see many church members questioning the wisdom of their move away from Labour towards the MP. This sentiment certainly reflects what a lot of Maori are thinking. The MP has morphed into something utterly foreign and inconsistent with its founding principles. I guess it was no coincidence that John Key was welcomed on with his Maori Party chums. It appears John Key and Pita Sharples share a close working and personal relationship. This makes me wonder whether or not the MP’s current closeness with the Nats is a result of personal feelings rather than pragmatic or ideological reasons. The Waikato-Tainui Parliament Te Kauhanganui voted to keep Tania Martin as its chairwoman. Martin's leadership was reaffirmed in an extraordinary meeting where 32 marae delegates supported her. Twenty-one voted against her and seven were invalid. This is an embarrassing outcome for both the King and Tuku Morgan and it reinforces the view that Tuheitia lacks the independence, intellect and leadership required. He has frustrated Te Kauhanganui, obstructed their Chairwoman and toed the Te Arataura line. He is weak and has not displayed the unifying skills required of a Maori monarch. This whole saga is a disgrace. Tuku Morgan has conducted himself in a most dishonourable manner and Tuheitia has shown he lacks the skills required of an Arikinui. The sooner they both leave the better. Following my week long hiatus I’ve finally had the chance to catch up on the news and I guess there is only one story – Hone Harawira. Unfortunately I have not had a chance to read much or time to gather my thoughts. Nonetheless I have quickly put together my initial thoughts on the issue. The key to understanding the latest Hone Harawira saga is simplicity. Much of the commentary in the blogsphere and mainstream media speaks of complex motives and hidden agendas – I think there is actually an absence of both. Hone Hone is an activist not a politician. He is not surrounded by flash advisers or expensive press secretaries. Honesty as opposed to strategy is his modus operandi. Hone penned that column in the SST as a warning to his colleagues. It was not a threat or thinly veiled strike against the Party rather a piece of honest prose critiquing the direction of the Party - a strong attempt to push the Party left I thought. It is important to realise that Hone is impulsive rather than considered and is supremely confident in his beliefs to the point of arrogance and uncompromising in the extreme. He does things without first grasping the possible consequences and when the consequences do not fit his purposes he fights them. We have seen this throughout his Parliamentary career for the example the Paris trip and his reaction to criticism and of course ‘that’ email. This latest saga is a perfect illustration of how Hone operates – with honest intent but without thought. His colleagues do not like him as a person. Te Ururoa may be motivated by self interest. He is Pitas natural successor but he knows if Hone wants the leadership it is his for the taking. Tariana will NEVER support Labour and she knows Hone WILL NOT support National for a second term. Tariana is stubborn and she is the superpower within the Party – she will get her way. Iwi are satisfied with the relationship between the MP and National and are comfortable with the continuation of that relationship. The iwi elite know that Hone and the left are hostile to their corporate agenda; therefore iwi will exert pressure to oust him and prevent the formation of a hostile government. Hone scares National voters and is an impediment to a long term relationship that pleases both sides. With this in mind it is not unreasonable to assume the Nats are pushing for his removal. I was surprised to learn the complaint was made by Te Ururoa, however I think he is merely the vehicle for Tariana’s discontent. If Tariana made the complaint and Hone survived she would look like a weak leader. It is also not in her interest to irritate the Party’s base anymore than she already has. There is a huge degree of hostility between the Party faithful and Tariana. This hostility boiled over when Tariana chastised Party members for criticising iwi leaders and more recently when local electorate branches formally opposed the MCA bill. This is a battle for the soul of the Party. A battle that may end up ripping the Party apart. If Hone leaves on his own terms, kei te pai, if he is forced he will take the base with him and as a result the mana of the Party. This is why I think this whole issue is a strategic blunder of epic proportions. The Parliamentary wing has allowed their own personal feelings and short term political considerations get in the way of what the people want – and they want Hone. Te Ururoa has tarnished his name and it will be interesting see how Waiariki perceive his move. I know Tuhoe and to a lesser extent Ngati Awa will think twice about supporting him this time around. At the end of the day Hone will not leave on his own accord. He loves the Party. Expulsion is a worst case scenario. NB: I blogged about the conflict between Hone and Tariana exactly two weeks ago. The post is well worth a read in light of current circumstances. Whakatane Mayor Tony Bonne is under police investigation for election overspending. Bonne spent $20,928 on his campaign – the legal limit is $20,000. Genuine concerns are also held that Bonne did not declare all his expenditure and some costs were inappropriately written off. Te Arataura initially threatened legal action against Ms Martin on two occasions yet failed to follow through knowing that their threats were of no consequence. Ms Martin initiated proceedings following her dismissal and her claims were heard by Hansen J, however no case existed because Te Arataura affirmed Ms Martin’s claims. She was in the right. In public Te Arataura has welcomed any review yet in private they have erected a number of obstructions including; triggering the disputes process, sacking Ms Martin (only for her to be reinstated) and illegitimately calling a general meeting of Te Kauhanganui. Members of Te Arataura were openly hostile and actively attempted to avoid meeting Ms Martin from the outset. Concerns raised by Ms Martin with respect to the actions of Te Arataura were taken out of context and subsequently misconstrued. Charles Joe, a Te Arataura board member, attempted to gag Ms Martin by making a wild claim that she cannot communicate with members of Te Kauhanganui without the express permission of the executive chair (Tuku Morgan). He then went on to add that all correspondence must be factual and the executive chair has the power to restrict correspondence he does not agree with. Outrageous stuff that goes to show the sense of supremacy Tuku operates under. Given Te Arataura lost in Court they have moved on to ‘suggesting’ to Ms Martin that she stand aside. A review committee meeting involving members of Te Kauhanganui and Te Arataura concerning Ms Martin’s report was subject to an attempted hijack by the Te Arataura members present. The members attempted to stop the meeting on numerous occasions citing technicalities and culminating in a motion to declare the meeting invalid. The motion failed. Tuku Morgan instructed a senior staff member not to process Ms Martin’s fee claims. Te Arataura refuses to supply the financial support it is obligated to provide. Ms Martin’s removal by the King was at the insistence of Tuku Morgan. Tuku Morgan also lobbied Ms Martin’s Marae. Tuku Morgan made false claims on Native Affairs as to the time and reasons for Ms Martin missing a scheduled appointment with the King. Te Arataura WILL NOT pay for an external review or ANY other costs related to the said review or the activities of Tania Martin. As a result her report cannot continue. Te Arataura is using their considerable power and resources against Te Kauhanganui. They have gone to great lengths to frustrate, castigate and alienate Ms Martin and Te Kauhanganui. They must have a lot to hide. Tuku Morgan has a great deal to answer – however knowing Tuku I do not think those answers will be forthcoming let alone truthful and accurate. A compelling report and rebuttal from Tania Martin (or indeed her legal team). It appears that Tuku and Te Arataura are in the wrong - big time. If what Tania Martin has claimed is accurate, and it appears so, then it can only be concluded that corruption, incompetence and sheer idiocy permeates Te Arataura. (If I have time I will try to extract the most relevant parts). 2011 will be, politically, an interesting year for Maori. The Maori Party (MP) should come out of the election in a strong position, assuming ceteris paribus, and the foreshore and seabed issue will either conclude or explode. The release of further aspects of the Wai 262 report will be a hot political issue, Maori youth unemployment and the growth of the Maori underclass will feature prominently in the minds of Maori and Whanau Ora will continue to cause grief for proponents and opponents alike. Post election the MP will, according to many commentators and i-predict, be kingmakers. This is assuming the party retains the five seats they currently hold. In my opinion this is not a given. Rahui Katene may lose her seat if the party continue to support the MCA bill in its current form. Hone, Tariana and Pita have a firm grip on their seats but Te Ururoa’s grip on Waiariki is more fragile. If Labour put up a credible local candidate (Annette Sykes jumps to mind) I think Te Ururoa will have a real challenge on his hands. However, I think it is safe to assume at this point the party will be neither weaker nor stronger post election. The bigger question is will Hone agree to prop up a National led government for a second term. I do not think he will. It will come down to a clash of personality and ideology between Hone and Tariana. Hone will not sacrifice his principles and I cannot imagine Tariana agreeing to work with those who stabbed a thousand daggers in her back. Tariana is no fan of her old masters, Phil Goff in particular, and is more conservative in outlook than Hone who is left leaning in most respects, however a Maori nationalist first and foremost. I have always imagined that factions exist within the party. Party members are mainly tino rangatiratanga advocates/Maori nationalists who, ideologically, are aligned with Hone, whereas the Parliamentary wing of the Party, excluding Hone, is slightly more conservative and pragmatic than the party faithful. Tariana will find it difficult to reconcile the two. There is significant discontent among Maori about the party’s relationship with National. But Tariana knows this is the political reality and it would be hard to manage the relationship any better. The same sort of policy win/policy loss ratio would exist with Labour as well – it is just the nature of small parties and their relationship with power. But back to the clash between Hone and Tariana. Tariana will win. She has the unqualified support of Pita and Rahui and to a lesser extent Te Ururoa. Although I believe Te Ururoa shares more in common with Hone he is a loyal and disciplined subject. Given this situation would Hone go it alone? I think so. Assuming National need ACT and the MP to govern I imagine Hone will hold the balance of power. If he left the MP would National still have the numbers to govern? Hone could demand considerable concessions if this situation eventuates. This situation would have interesting ramifications in terms of the foreshore and seabed and other important Maori issues. The MP could push for a far better deal if they are in a position to decide who occupies the Treasury benches. The party would actually have effective leveraging power. Throughout this post I have mentioned Tariana as the central figure in the MP. This is because I believe Pita is largely irrelevant. Tariana clearly wears the pants - the Party direction is dictated solely by her. This is worrying for anyone hoping for a Labour led government but comforting for those wishing to see the opposite. Either way it’s going to be interesting. I sympathise with the Ngati Rangitihi people of Matata. They have, as a collective, appealed against some terms of the resource consent granted to Carter Holt Harvey and Noske Skog – the two companies that operate the Tasman Mill in Kawerau. Specifically the length of the consent (25 years) and the amount of waste that can be discharged into the Tarawera river. The appeal was dismissed by the Environment Court and on further appeal the High Court. Ngati Rangitihi has now expressed intention to appeal to the Court of Appeal. Realistically, they have slim hope of a favourable ruling. An appeal can only be made on points of law so Ngati Rangithi must prove that the hearing commissioners or previous Courts erred in the application of the law. I do not think they did. The High Court judgement is, in my opinion, reasonable given the special circumstances. However, I think the Court and the hearing commissioners strayed in relation to Maori viewpoints. Adequate weight was not given to the views and concerns of tangata whenua. Lip service was paid but the decision did not reflect the deeply held concerns of the Maori communities affected by the decision. This situation is not uncommon in local government and judicial decisions largely because the decision makers have little understanding of Te Ao Maori or any sympathy for and connection to Maori communities. Indifference usually characterises high level decision making as well. People become units, the whenua becomes a resource and taonga becomes an opportunity cost. Unfortunately further Court action poses a risk to the Mill and the 500+ jobs it sustains. Carter Holt Harvey must upgrade its recovery boiler by March 21 and they will not do so unless they have long term operational certainty. If Carter Holt Harvey closed then Noske Skog would in all probability follow suit consequently the sawmill would suffer a huge drop in domestic demand and theoretically SCA (tissue manufacturers who operate at the Mill) would have no reason to operate from an isolated, empty mill. This would be a huge blow to Kawerau and the Eastern Bay. The Mill keeps household rates in Kawerau comparatively low, sponsors community events and provides jobs for the Eastern Bay of Plenty (most Mill workers live outside of Kawerau in lifestyle towns like Ohope). The Mill is also a triumph of unionism – wages are high thanks to strong union action over the past 50 years. The Eastern Bay economy would be nothing without the companies that operate from the Mill. Therefore, I think the Judge was correct in dismissing the appeal on those grounds, however I still do not like the content of his ruling. The term should have been reduced by five years, allowing for long term operational certainty yet giving effect to the concerns of tangata whenua, and discharge restrictions should have been further tightened over time. I feel sorry for Ngati Rangitihi, they are only acting as kaitiaki yet they do so with little chance of success and sadly some ignorant people in the community see them as trouble makers rather than caretakers. The December issue of Te Hookioi, a monthly magazine covering Tainui affairs, carries a piece produced by Te Arataura, specifically Tuku Morgan, attacking Tania Martin. I intended to upload the piece but I cannot do so without permission. In general the piece is fairly spiteful and exaggerated. It is a good example of emotive writing but a poor attempt at establishing the facts. Some figures are provided yet they are without adequate context and other allegations contained in Tania Martins report are not addressed. Essentially, a pretty unsatisfactory rebuttal from Tuku. I guess the truth will become apparent in time.